CRF250X airbox and jet - DAMN Riders - No rules, Just ride! I just picked up a 2016 CRF250X and I would like to open up the airbox and adjust the jetting. The problem I am facing is that I am not a mechanic and doing this may require removing the carb. I certainly want to learn how to work on my bike for instances like this but I also do want to use a 7K bike as a guinea pig. Looking for a mechanic or someone who has done this before help me out. I will be happy to pay for any service but would like to learn at the same time. Im in Balto County so any referrals are greatly appreciated. If you're not in a hurry to get it done I'll have some time at the end of April. Be glad to give you a hand. I'm pretty sure you can rejet it without pulling the carb. Easy enough job. As a guy who is also NOT a mechanic. I can understand your apprehension to use your nice bike "as a guinea pig". That said, doing a rejet really isnt that hard. 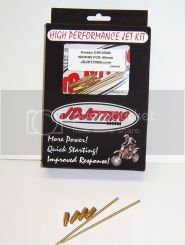 Look online for a tutorial on "rejetting your dirtbike". You can probably even find one for specifically for your Honda CRF. I successfully rejetted myself from watching a few videos and following the recomwndations from a jet kit I bought. I would not recommend cutting into the air box. Opening up the exhaust, taking out the emissions crap and are-jet, Will have that bike up to par. Get manual adjustment screw for the mixture screw as well. PM if you have any questions. Kiding aside, you are in good hands. If you want to tinker more with the bike you should think about picking up a service manual. It will help greatly with stuff like this. Also, sounds like you may be new to the bike thing so make sure you set your sag and don't be afraid to roll your bars and move your controls around to make the bike more comfortable. Beat it to fit, paint it to match. I never heard any complains. I think you're right; there might be a snorkel. Removing that will help with the other mods. It was common to hack away at the air box of bikes in the early 2000s. The crfx responds well to just simple mods and has plenty of flow into the air box without permanently nodding the air box.